About Map: Map showing where is South Africa located in the World. 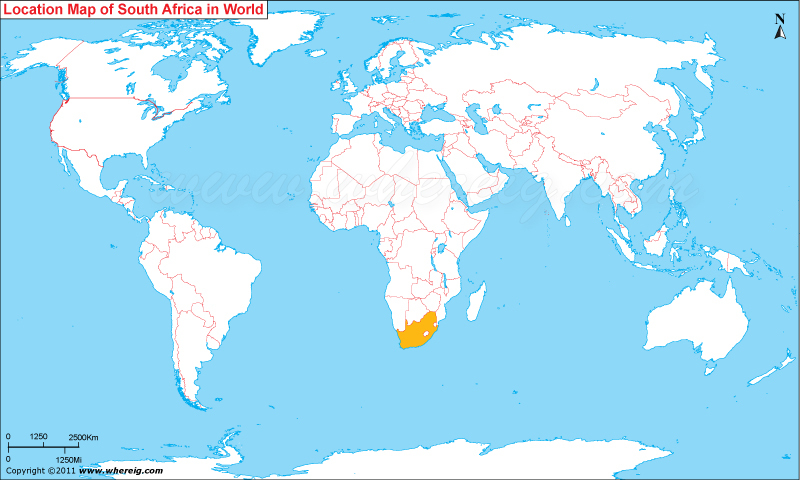 The given South Africa location map shows that South Africa is located in the southern part of Africa Continent. South Africa map also shows that it shares its international boundaries with Swaziland, Mozambique, and Zimbabwe in the north-east, Botswana in the north, Namibia in the north-west, and Lesotho entirely lies in the South Africa as enclave. Besides, the Indian Ocean lies in the east and south-east and Atlantic Ocean lies in the west and south-west. The climate type of South Africa is temperate. South Africa is more commonly known for the diversity of cultures, ethnicity, and languages. The capital city of South Africa is Pretoria (Administrative), Bloemfontein (judicial), and Cape Town (legislative). The government type of South Africa is a constitutional democracy in the form of a parliamentary republic. Under this system, the President of South Africa is both head of state and head of government; in the same fashion as the prime minister of other nations. The president is elected by the National Assembly. Besides, it is member of the African Union, the United Nations, NEPAD, the Commonwealth of Nations, World Trade Organization, International Monetary Fund, G20 and G8+5, Antarctic Treaty System, Group of 77, South Atlantic Peace and Cooperation Zone, and Southern African Customs Union. Moreover, the economy of the country is of mixed type and hence depends upon the some of the significant sectors including agriculture, mining, industries, manufacturing, and services. The important minerals are diamond, chrome, manganese, platinum, vanadium, vermiculite, ilmenite, palladium, rutile and zirconium. Besides, tourism is also growing in the country.